Tugtar Astrálaipiotacas (nó Australopithecus i Laidin) ar phríomhaigh éagsúla atá imithe in éag, a bhí cosúil le daoine is a bhí ann díreach tar éis don ghéag dhaonna scoilteadh ó ghéag na n-ápaí san éabhlóid. Tagann an ainm ón Laidin agus ón nGréigis; australis (Laidin) "deisceartach" agus πίθηκος/pithekos (Gréigís) "ápa". Seans maith go raibh an t-ainmhí seo an-ghaolmhar le sinsear an duine. Ciallaíonn an téarma ‘ápa deisceartach’: fuarthas iontaisí den speiceas seo a chéaduair i ndeisceart is oirthear na hAfraice (san Aetóip, an Chéinia is an Tansáin). Timpeall 5.5-1 milliún bliain ó shin an dáta a bhí ag cuid acu, ach tháinig an chuid is mó a fuarthas ó timpeall 4-1.5 milliún bliain ó shin. Ainmhí le hinchinn bheag is aghaidh smuilceach ab ea é. Shiúil sé ina cholgsheasamh ar dhá chos ghearra. Bhí na géaga uachtaracha cumasach. Bhí sé urbholgach. Bhain sé feidhm as uirlisí, agus seans go raibh urlabhra aige. I 1977 d'fhionn beirt eolaí Meiriceánach, Tom Gray is Donald Johanson, iontaise homanaide san Aetóip a bhí 3-4 milliún bliain d'aois. Bhí dóthain cnámh ann chun 40% d'indibhid iomlán a dhéanamh, beagán níos mó ná meadar ar airde. 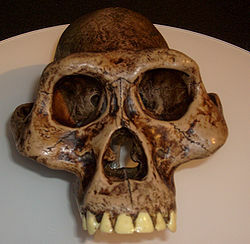 Tugadh an t-ainm eolaíoch Australopithecus afarensis ar an eiseamláir seo den homainid cheart is luaithe, agus sa ghnáthchaint, tugtar Lucy uirthi. Mhair Astrálaipiotacas níos déanaí ná an Homo is luaithe, agus uaidh sin meastar nach sinsear díreach de chuid an duine é.
Tugadh an leathanach seo cothrom le dáta an 5 Feabhra 2018 ag 03:36.